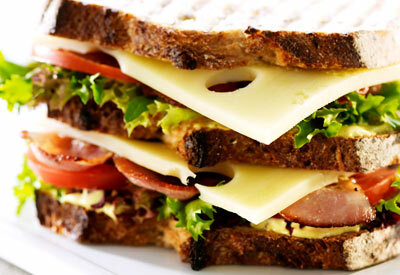 Jarlsberg turns a regular BLT sandwich into something special. Combine dressing ingredients and stir to blend. Spread some dressing on the first slice of bread; add two slices lettuce, two slices tomato, one slice Jarlsberg and two slices bacon. Repeat. Top with the third slice of the bread. You can make a facsimile of creme fraiche by adding a tablespoon of buttermilk or a half cup of sour cream to a cup of whipping cream, heating it gently to 110 F, then putting it in a loosely covered bottle in a warm place and letting it sit for anywhere from 8 hours to a couple of days, until thick. Store it in the refrigerator, where it will thicken further, and keep for about three weeks. In general, creme fraiche and sour cream can be used interchangeably in most recipes, but creme fraiche has two advantages over sour cream: it can be whipped like whipping cream, and it will not curdle if boiled.